Successful leaders are often fond of recounting how they gained their first insights into the world of work as teenagers delivering newspapers or packing groceries. But teens in America are apparently no longer following this hallowed tradition, creating a whole generation of young people unprepared for the world of work. 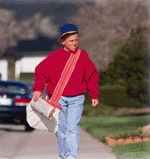 In 1990, nearly 70% of newspaper carriers in the US were teenagers. But that figure had dropped to 18% by 2004 and is likely to fall even further, according to the Newspaper Association of America. And while there are industry-specific reasons for the decline in the number of teens working newspaper routes (papers tend to de delivered earlier these days, and usually require driving), teen unemployment generally is at a historically high level. Human resources experts are warning that this has serious implications for employers seeking a quality workforce. The problem isn't a lack of jobs. The US economy is in good shape, and employers are often desperate for people they can hire and train. And neither, it seems, is it because teens don't want to work. Despite the popular image among adults of teens as lazy, MySpace-addicted and work-shy, surveys reveal that many young people would like to work but simply can't find a job. Anecdotal evidence suggests that a number of developments are crowding teens out of the workplace. Employers are starting to hire immigrants rather than teens. And because hiring usually happens through social networks, employing one immigrant often leads to hiring more, creating a mushroom effect. Another group replacing teens are workers aged 55 and over, seeking to supplement their incomes. In addition, the shift in the US economy from manufacturing to services has created a corresponding shift to low-paying, low-skilled work. This has hurt boys in particular, with disadvantaged minority youth hardest hit. All of which means that many teens are not learning vital skills from early work experiences, resulting in increasing numbers of young people entering the world of work ill-prepared for the challenges they face. A survey of more than 400 US executives and human resources professionals published in October reported that the vast majority of US high school graduates are deficient in written communications, professionalism and problem-solving. The report called on business leaders to take a leading role in creating employment opportunities for young people to master necessary skills, whether through partnering with schools and non-profit organisations, or providing internships and summer jobs. However, it also revealed an unwillingness among US businesses to play their part: 75% of the those surveyed said that the school system should be responsible for developing the necessary skills in the workforce; only 11% said it was the responsibility of the business community.